The town of Watson Lake is known as Canada's "Gateway to the Yukon." Located just inside the Yukon border, this community of over 1,500 people provides a broad range of services for the travelling public. The traditional territory of the Liard First Nation surrounds Watson Lake. 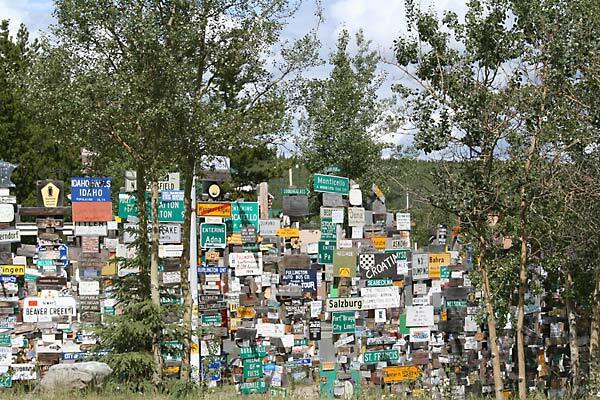 The World Famous Sign Post Forest is Watson Lake’s best known attraction. So famous, it is known - and mimicked - around the world. The forest was started in 1942 by a homesick U.S. Army G.I., Carl K. Lindley of Danville, Il., Company D, 341st Engineers. While working on the Alaska Highway, he erected a sign here pointing the way and stating the mileage to his hometown. Others followed his lead and are still doing so to this day. On July 20, 1990, Olen and Anita Walker of Bryan, Ohio placed the 10,000th sign. Carl K. Lindley and his wife visited the site in 1992, 50 years after his first post was erected. Today, the Town of Watson Lake maintains the site, erecting more posts as they are needed through the Adopt-A-Post Program. Located near the forest is the Alaska Highway Interpretive Centre. This is often the first Yukon stop for northbound travellers. Besides providing information on the territory, the centre interprets the remarkable history of the highway through photo murals, realistic displays and dioramas, a three projector audio-visual presentation and a unique winter night scene illuminated by northern lights. Within the Signpost forest and park there are pieces of equipment on display that were used in the construction of the highway. A time capsule and cairn was placed on site in 1992 with plans for it to be opened in 2042. Early in 1897, American (Lake Tahoe) Frank Watson at the age of 14 left California and headed north with his father to seek gold in the Klondike. They worked two claims on Bonanza Creek until sometime after the flood of 1903 when he headed to the Upper Liard River area. He was the first white man to travel over land to this area, most traveled on the rivers. He married Adela Stone and they settled on the shores of Fish Lake, later to be known as Watson Lake and led a life of a prospector and trapper. He moved his family a few miles north to Windid Lake as more people started to settle in the area. He died in 1938 after contracting pneumonia while in Lower Post. He died in route to Fort Saint John after being airlifted out on a mail plane. His children and grandchildren continue to be an intricate part of the Watson Lake community. Airport construction, in conjunction with the construction of the Alaska Highway a year later, signaled the true beginning of the town of Watson Lake. The community started as an accommodations and supply centre for this construction. The “Alcan Project” was a response by the American Army to the perceived threat of Japan during the Second World War. It provided an overland supply link between Alaska and the lower 48 states. The original highway, little more than a rough trail of 2,450 km (1,522 miles) from Dawson Creek, B.C., to Delta Jct., Alaska, then on to Fairbanks, Alaska, was built in the remarkable time of 8 months, 12 days. A cairn was erected in 1992 in dedication to the pilots who flew into the Watson Lake area during the war. A steam engine is also on display, which was used in the construction of the airport. An overnight camping area has been developed for use by itinerant pilots. The campground has picnic tables, fire pits and firewood supplied in the tenting area. Today, the town of Watson Lake is the key transportation, communication and distribution centre for mining and logging in the southern Yukon and northern British Columbia. It is also a major service area for tourism and is the "Yukon's Gateway."